Why Is Nancy Pelosi the Most Dangerous Woman in America? Most people see Pelosi exactly the way she wants them to: a cultured San Franciscan politician from an esteemed family. But underneath the Chanel suit and Mikimoto pearls is a true political boss - as in T weed. Don't be fooled by her image as a caring, grandmotherly public servant. Nancy Pelosi is all business. She's the Boss charts Pelosi's carefully orchestrated rise to power as a uniquely American ruling-class diva who is not so subtly replacing "by the people, for the people" with "have your people call my people." From her father - a congressman and then mayor of Baltimore whose political machine was tainted by scandal - Pelosi learned about patronage, ruthlessness, and the credo of the party boss: never admit to anything, never apologize, and attack when challenged. As Speaker of the House, Pelosi once pounded her gavel so hard it left a dent in the lectern. She frightens even those who agree with her on almost everything. She punishes those who stand in her way. And her hypocrisy knows no bounds: While Pelosi spends millions in taxpayers' dollars to green up the capital and expects Americans to pay for their carbon footprints, she demands a bigger jet for her trips across the globe as well as military G5s for holiday weekends. She claims to act for the benefit of the American people, yet enriches her family's portfolio through pet legislation and personal financial dealings. She tried to enact taxpayer funding for abortions, defying the teachings of the Catholic Church, of which she is a member. With promises of utopia, she drives massive legislation deals through Congress by stiff arm twisting, knowing she and her allies will profit at the expense of the electorate. 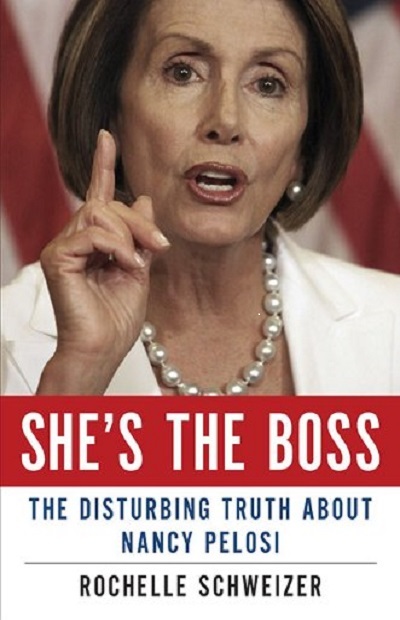 It will be clear after reading She's the Boss that the party works for Pelosi.